To enter, simply send me an email at DavidPWelsh at Yahoo dot Com that mentions your favorite comics mother or mother figure. By “favorite,” I don’t automatically mean the character that fills you with greeting card feelings, and if your tastes run more in the direction of Medea than I Remember Mama, that’s absolutely fine. 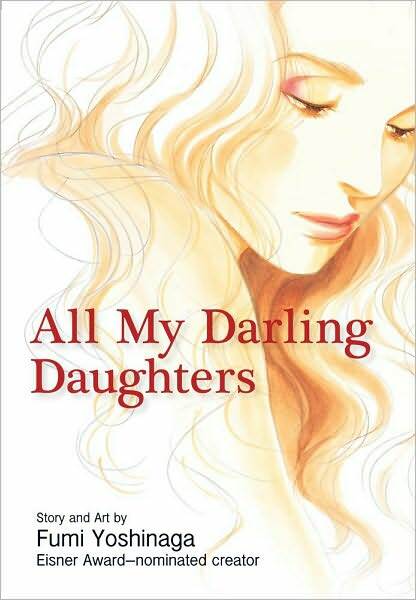 If you already have a copy of All My Darling Daughters but still want to sing the praises of a compelling comics mom or grandmother, please feel free to do so in the comments. Deadline for entries will be at 11:59 p.m. Eastern Standard Time Saturday, Feb. 6, 2010. You must be 18 years of age or older to enter. This entry was posted on Wednesday, February 3rd, 2010 at 10:50 am and is filed under Contests and giveaways, Linkblogging, Viz. You can follow any responses to this entry through the RSS 2.0 feed. Both comments and pings are currently closed. I already have a copy, but I just thought I’d chime in. Due to imprinting on them when I was a teenager, I sort of adore Akira Ijyuin’s twin moms from The Man of Many Faces. Yeah, they’re weird and irresponsible and request that their son steal weird crap for them–but something about the entire concept still manages to crack me up all these years later.